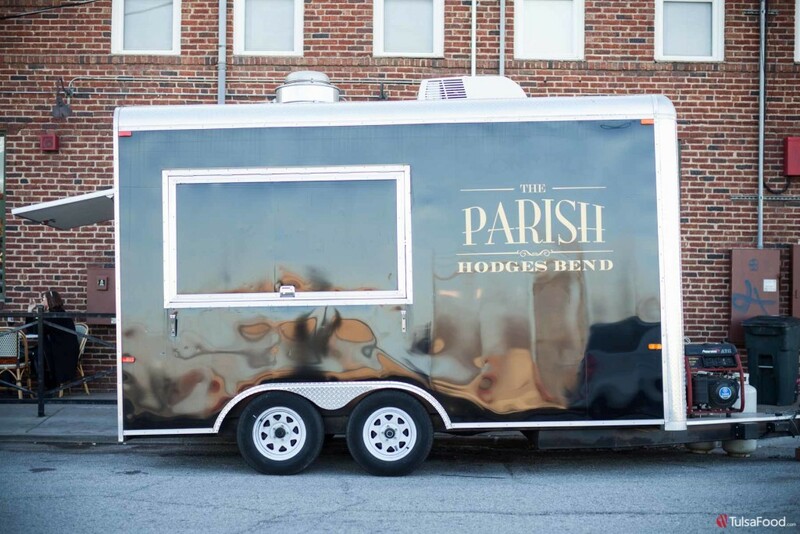 I’ve had my eye on the sleek black food truck parked outside Hodges Bend for some time now. If you have too, I encourage to you to put your curiosity to good use and grab a bite. 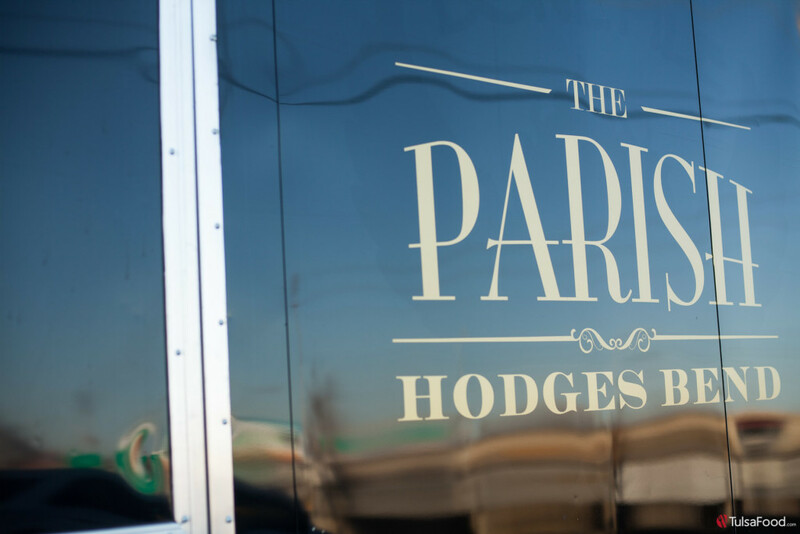 The idea of having a kitchen at Hodges Bend has been in the works since the bar’s inception–the space just wasn’t there. A food truck was indeed the answer to the problem. The masterminds behind Tulsa’s newest gastropub cuisine are Chef Ian Van Anglen and Hodges Bend co-owner, Noah Bush. The two come from similar backgrounds, both growing up in the service industry, working their way up through the ranks. While in conversation with the pair, it was clear that they knew what they were talking about. They have certainly seen it all. Both started out as dishwashers in their teens, with Noah eventually moving to the front of the house and Ian to the back. I can’t think of a smarter combination of two people for a new business venture. The level of cuisine coming from The Parish is that of a fine dining restaurant, with the affability that only a food truck can offer. “Quality doesn’t have to wear a suit and tie,” said Noah. So, as it happily turns out, anyone who would like to have a damn good dining experience can absolutely enjoy one here. Better yet, you can enter Hodges and be waited on by the knowledgeable staff, without even realizing that the establishment doesn’t technically have a kitchen. When I heard there was poutine on the menu, I was ecstatic, but apprehensive. 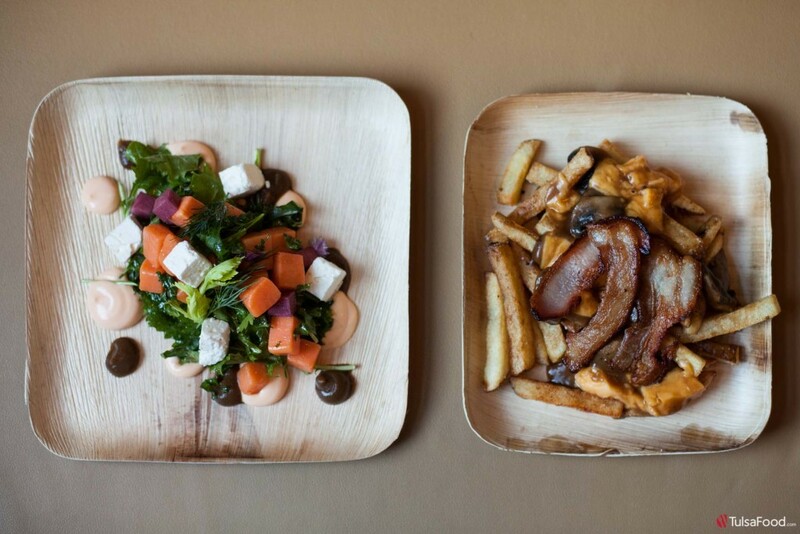 Poutine is a French-Canadian classic, one that I have sampled while out of town but have never had the opportunity to try here in Tulsa. It traditionally consists of three main ingredients: french fries, cheese curds, and gravy. In my opinion, a successful poutine has just enough gravy to attack the curds with warmth and flavor, without overwhelming the fries into a soggy nightmare. 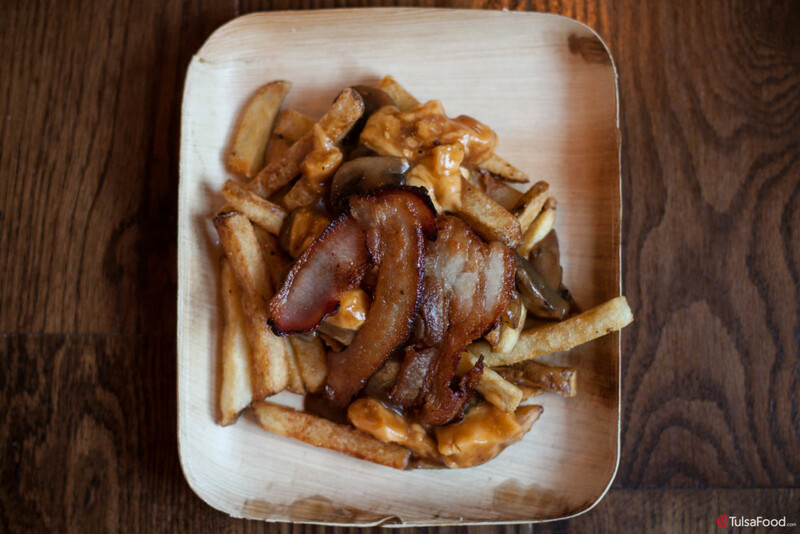 Chef Ian Van Anglen did a brilliant job with his rendition, incorporating some tasty house cured bacon, local cheese curds, and mushroom gravy over the hand cut fries. Warning: this is not the dish for someone just wanting a light bite. It is exactly what you want to be eating around midnight on the weekend. The dish will put you out a mere $9 and there is an option to add an egg for an additional $2. The menu had it well-paired with a vibrant ’13 Jean Louis Trocard Sauvignon Blanc and Semillon blend from the Bordeaux region of France. It came as no surprise that it was indeed the perfect match, as Noah Bush is a spot-on sommelier to boot. 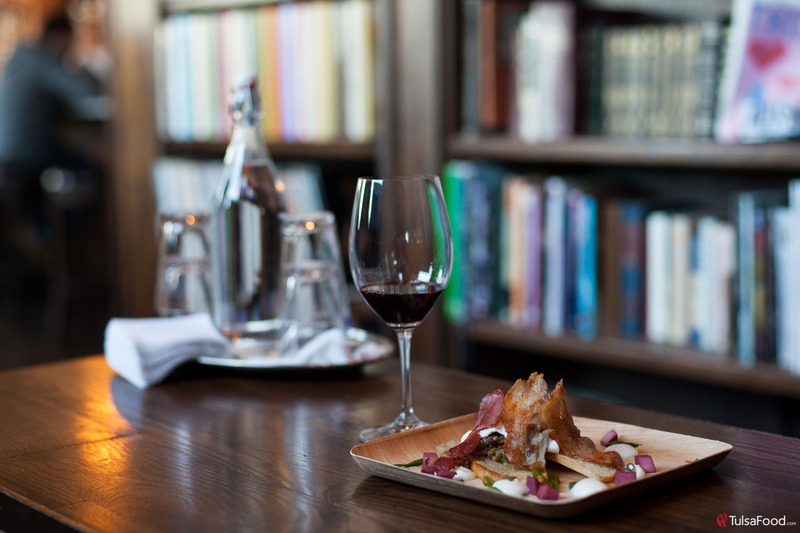 Truth be told, Hodges Bend is known for catering to a knowledgeable clientele who expect to be dazzled by only the best in service, fine wine, curated coffee and craft cocktails. I will be honest with you, TulsaFoodies: I am the last person to order a salad when dining out. Ask anyone who knows me and they will be stumped trying to think of when I last ordered a salad at a restaurant. It hasn’t happened in centuries. I’m a carnivore through and through, and I’ve always seen a salad as a frivolous and unnecessary addition to something grander. However, the Sweet Potato Salad simply blew me away. 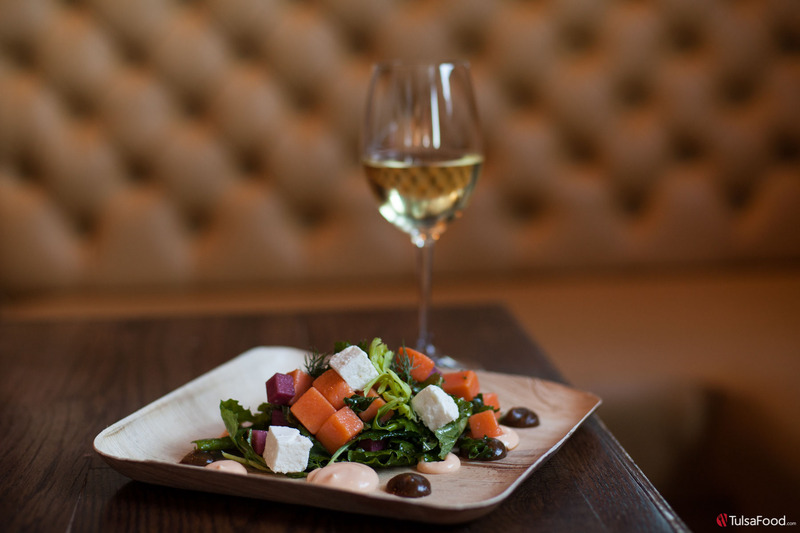 The $8 salad features Scissortail baby kale, valbreso feta, pickled turnip, and barrel aged sherry vinaigrette. It was crazy delicious, and completely caught me off guard; I’m not used to feeling this way about kale and turnips, but I have become a talking-in- tongues-convert. I tried everything individually but when I combined it all together for the coveted perfect bite, it became all too clear that the ingredients were in a most delightful, tasty balance with one another. This salad had rhythm and verve. It was paired with a refreshingly light white wine from Oregon’s Willamette Valley, the ‘11 Matello Caprice Blanc & Gris. The total experience was dreamy. I felt like if I closed my eyes, I was back in the wild hills of Umbria enjoying a sweet mid-afternoon summer picnic. When food has the power to transport you to that vacation zone without breaking the bank, you know you truly have a rare gem in your hands. Two days later and back to reality, I was pacing the floors of my apartment thinking about this salad. 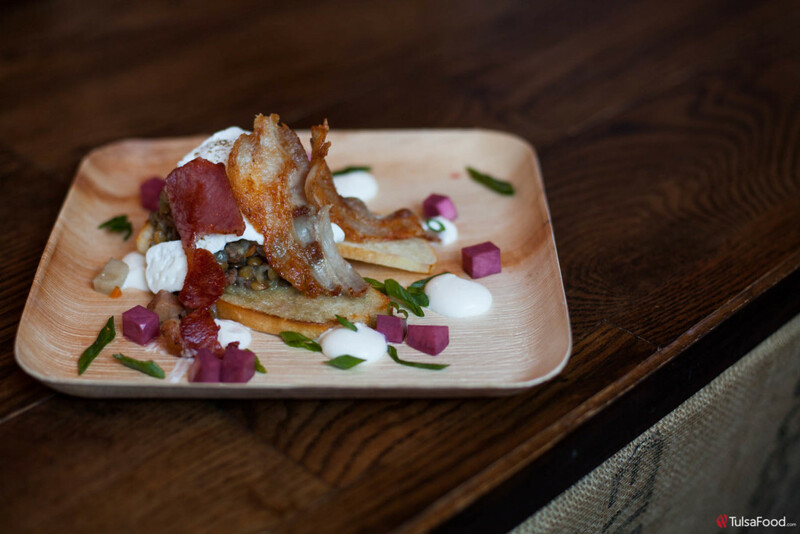 Just when I thought I had reached the utopian pinnacle of salad paradise–the kind of stuff that makes you think you’re ready to get out the yoga mat– Chef Van Anglen pulled out the piggy treat. By placing that lovely Pork Belly dish ($11) in front of me, I was resuscitated back to my true carnivorous self. This is the star of the February menu. Imagine this: toasted country bread, lentils, pickled turnip (a welcomed reprise), poached egg, thinly sliced pork belly and crème fraiche. To top it off with added finesse, Hodges had this paired with a fruity and slightly smoky ’12 Barnard Griffin Merlot from Washington State, adding further complexity to the experience. Yes, I made noises–it was that good. I found myself unapologetically entranced by an odd sense of joy while stabbing the poached eggs over the toasted country bread. This dish will make you do that, too. There are so many satisfying components to this dish, so be prepared to be moved. Every ingredient, texture and taste was in full, yet unadorned harmony…ultimately revealing that this is definitely The Parish’s trademark. It is simple and delicious excellence expressed, when nothing overwhelms the plate, and the flavors and textures align in complete equilibrium, yielding an overall impression of, “wow, I want to hang out here a while.” Usually I consider myself to be a very generous person, but this menu item brought out the mean, barbarian glutton in me, and there was no sharing. I don’t know which exotic location this dish took me to–all I know is that I’m ready to set up camp there and start a new country. Desserts are my kryptonite. I’m still waiting for the day someone starts a dessert rehab, because I may just be the model test subject. When I saw that there was a Lemon Bar on the menu, I got excited. 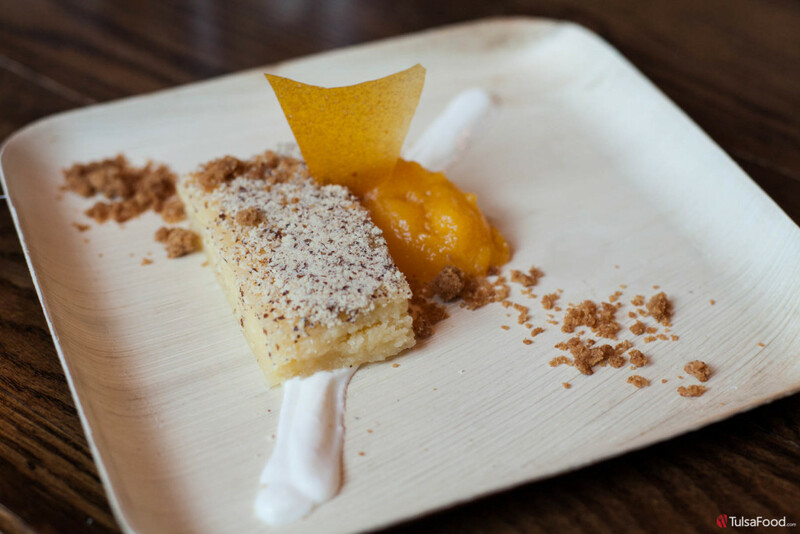 This dish is a testament to Van Anglen’s vision of “taking childhood favorites and elevating it.” The Lemon Bar was dusted with almond powder, creating a nice, subtle, crunchy texture that complimented the smooth but heavy lemon filling. There is no crust–instead it is accompanied with graham crumble, crème fraiche, and mango. Somehow, I made room not just for the lemon bar but the Sommariva Prosecco as well. Who can resist some bubbly with such a wonderful dessert?! You can follow The Parish on Facebook and Twitter to find out about menu items and events. All major credit cards are accepted, in addition to cash. I encourage you to try The Parish–you won’t be disappointed. See an error? 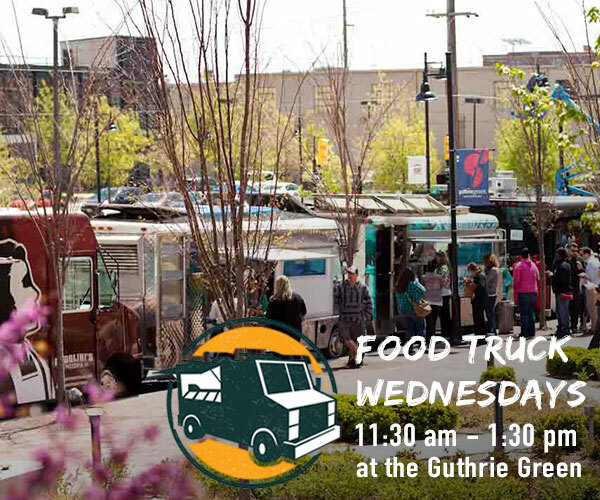 Please send corrections to suggestions@TulsaFood.com. Thanks for reading! Monique Garmy is an Admissions Counselor and Diversity Outreach Coordinator for The University of Tulsa College of Law. She received her BA in Spanish and Creative Writing from The University of Tulsa, with a semester abroad at La Universidad de Belgrano in Buenos Aires, Argentina. Monique's passion for food and culture was developed at an early age, undoubtedly the result of being raised in a French-Colombian home that celebrated unique culinary experiences. This multicultural exposure has fueled an inherit need for adventure; to this date she has been to over 15 countries and has enjoyed every bite of her travels! A Tulsa native, Monique is thrilled to celebrate the growth of the city’s palate through her writing for TulsaFood.